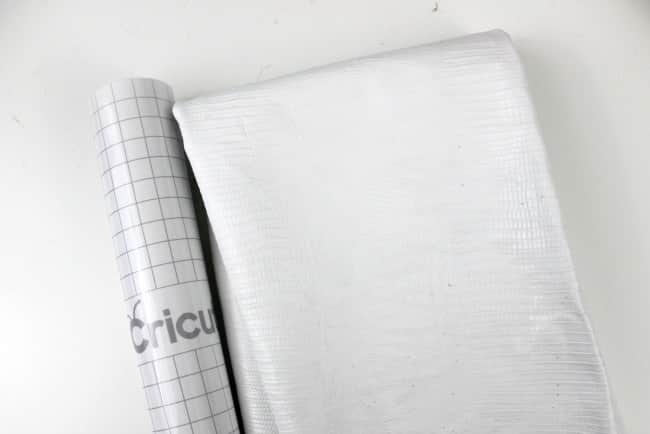 If you’re a regular blog reader here, than you already know that I LOVE my Cricut Explore. 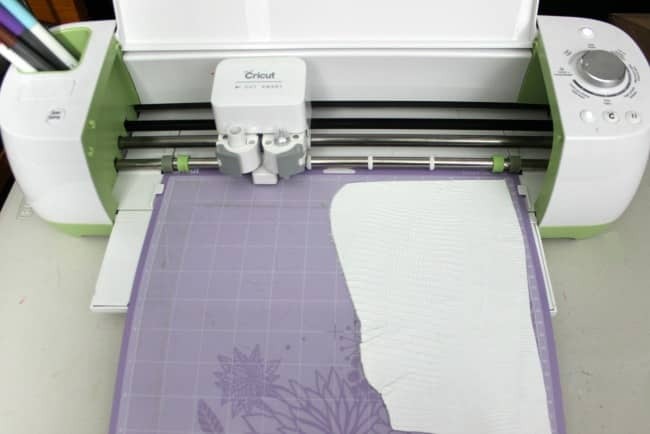 I love it so much in fact, that I’ve teamed up with 12 amazing Canadian bloggers to show you just what a Cricut Explore can do! We have made 12 festive ornaments using our Cricut. 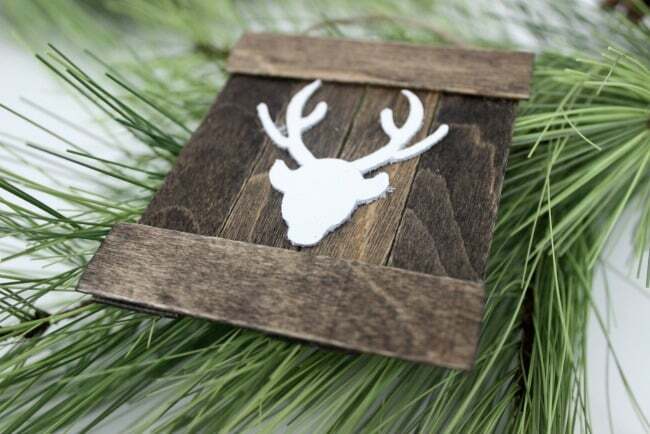 I can’t wait for you to see what everyone is up to, including these Mini Deer Pallet Ornaments! I used leather for the deer head in this project – mostly because I really wanted to cut leather on my machine! 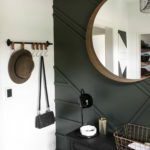 You can use vinyl, or felt or any material you like. 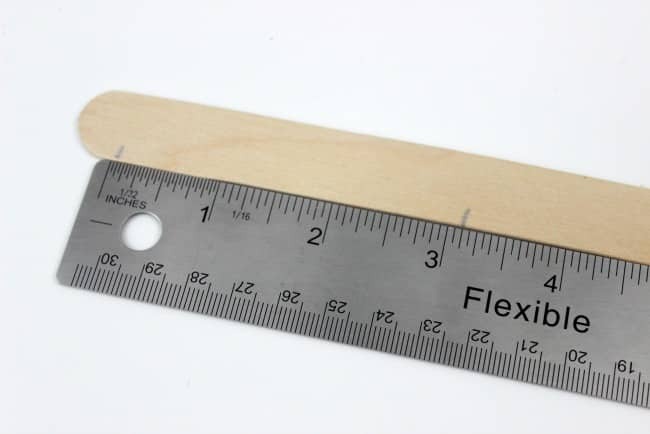 When you cut leather on your Cricut Explore, you may need a deep cutting blade. Mine leather wasn’t terribly thick, so the regular blade did the trick. 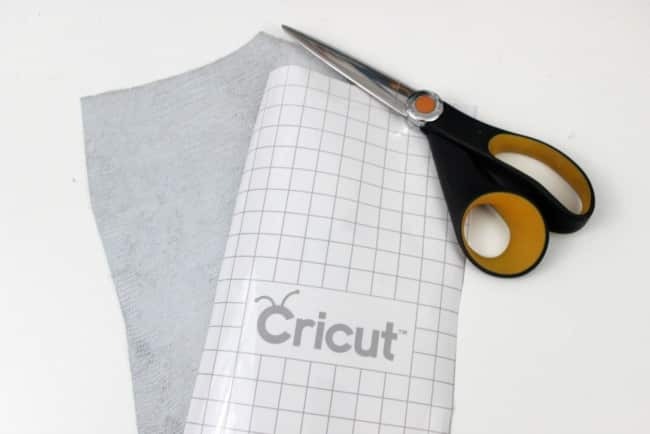 There are two reasons for using transfer tape on the back of the leather: It keeps the leather firm and it protects your Cricut cutting mats from the fibrous material (you want your mat to last as long as possible!). 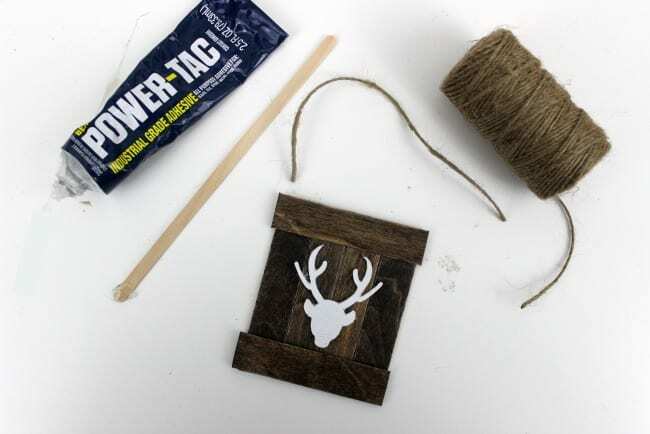 It does a perfect job of cutting the miniature deer ornament! Cut the transfer tape so that it covers the piece of leather you are cutting. I did two versions of these deer, because I wasn’t sure which one I liked better. The ones pictured in this post are the smaller deer heads in the photo. You can access my design HERE, when you sign into your Cricut Design Space. 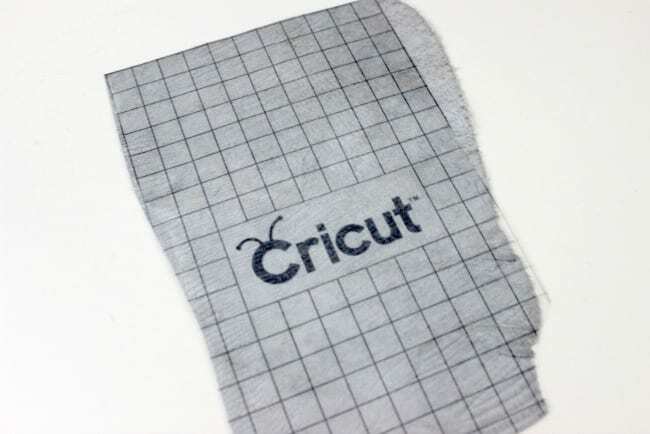 Set the dial on your Cricut to “custom”, and then select “Leather – 2mm” from the options menu. 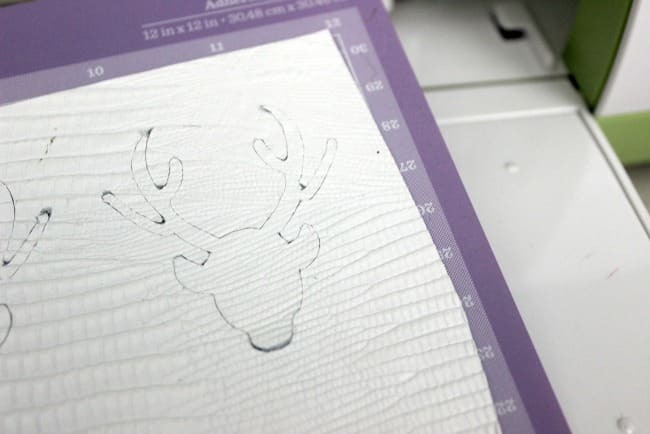 Your Cricut will automatically do 3 or 4 cuts, and the deer should come out perfectly! Next grab those popsicles and cut them for the mini pallet. The four across were 3.5″ each, and the top and bottom pieces were just over 3″ each. 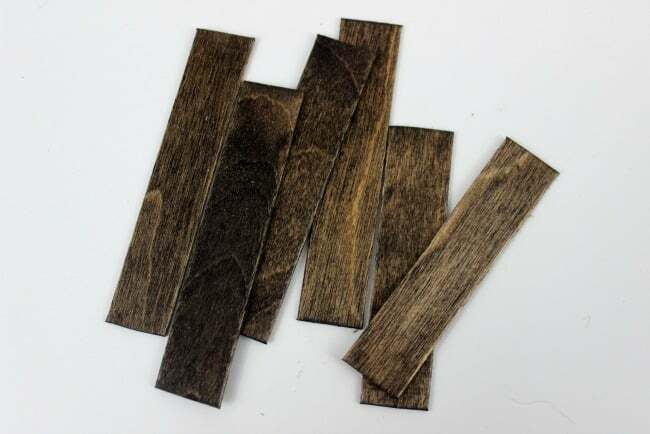 Once they are cut, you can use wood stain to stain the popsicle sticks if you want to. When it comes to glues, I can be very picky! (Does that make me sound like a snobby DIYer?! lol). I just don’t like glue guns leaving strings and globs, and not letting my projects sit flat. 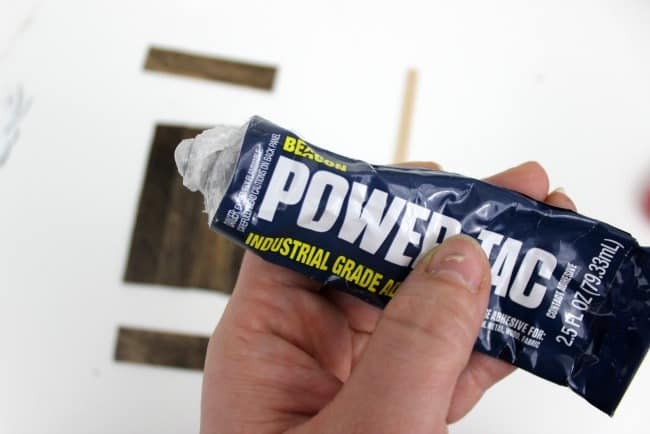 Power-Tac was the perfect glue for the job! I used the Power-Tac glue to attach the pallet popsicles, and the jute string to the back. It holds so well, I won’t have to worry about it breaking anytime soon! 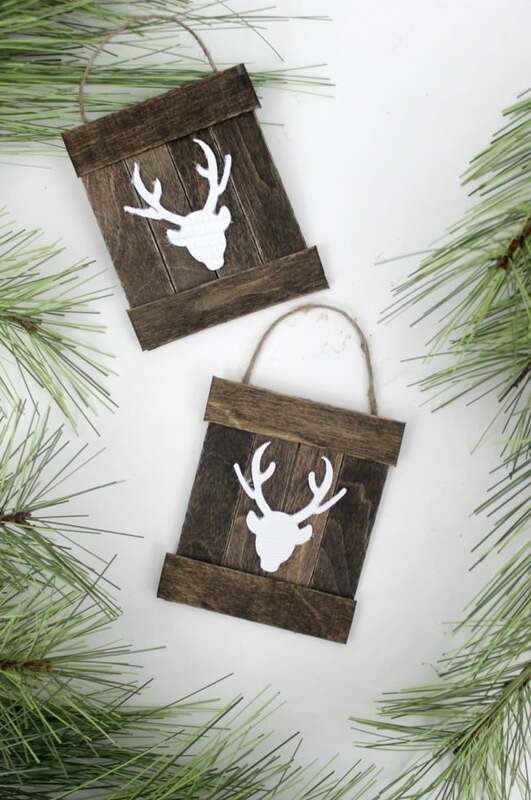 What do you think of my little rustic ornaments?! I hope I inspired you to make something this Christmas! 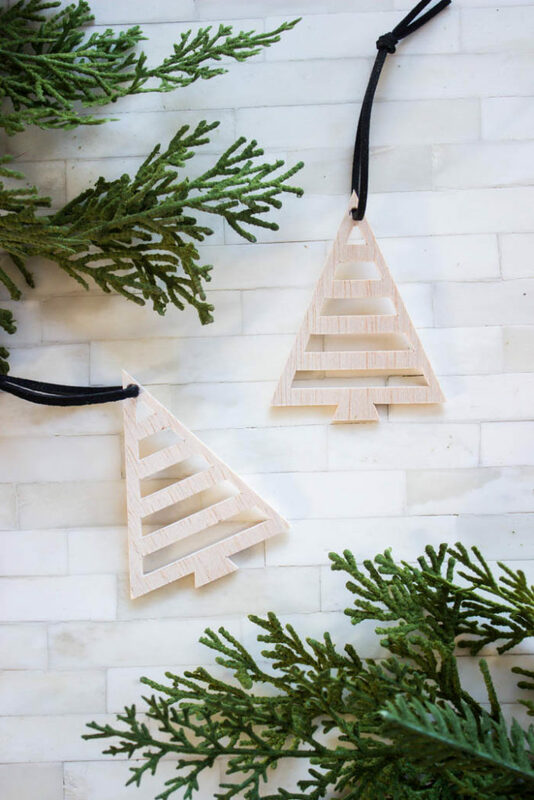 If you love this DIY, you might love these Wooden Tree Ornaments too! 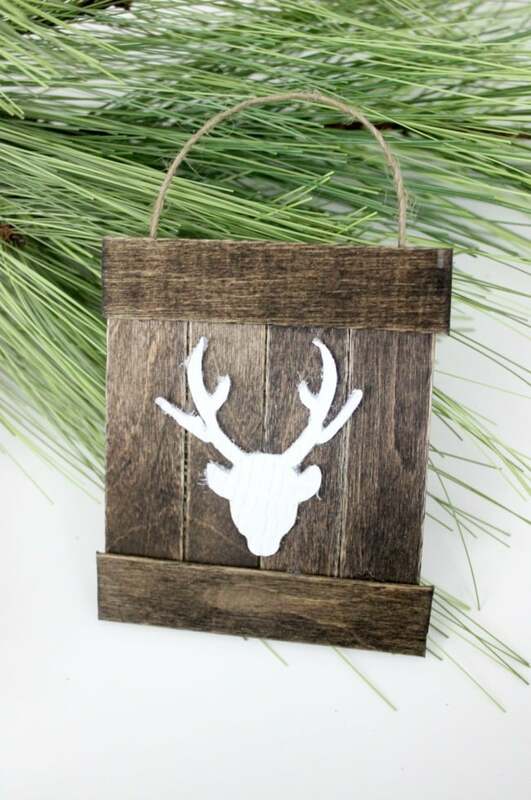 If you liked this miniature deer ornament, don’t forget to check out the other great Christmas Cricut Ornaments from my Canadian blogging friends! 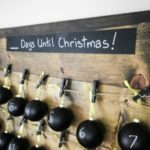 If you love rustic ideas, don’t forget to check out my easy DIY rustic advent calendar! 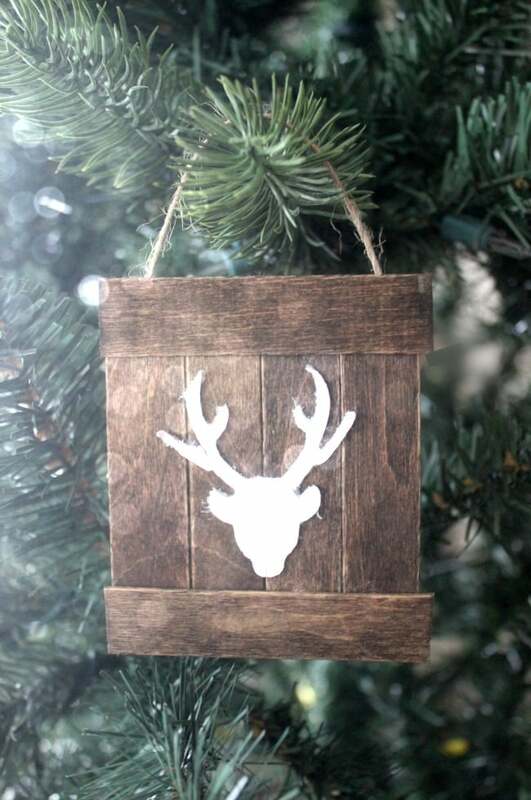 If you like simple, rustic ornaments, here’s another great one I did with my Cricut Explore! So cute, can’t wait to try it! 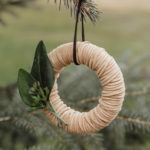 Oh man, wood ornaments were actually next on my list to make.. this one looks SO cute! 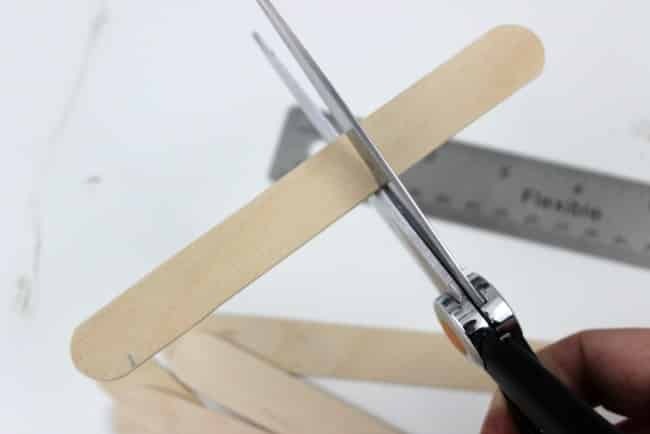 I never even thought about using Popsicle sticks – this is such a clever and cost effective idea! Definitely trying this one. I love these! The mini pallets are so cute! Thanks for the great tutorial! I love this! The pallet background is perfect. I have the same glue and love it. Great project. I’d love to make some gift tags for presents this year!!! I would r to make some personalized wall decals for my daughter nursery. I would make that reindeer only bigger for front of my shirts. Thanks for the chance!!!! I would make everything with one of these!! I would love to make summer holiday mugs fire my family. My mind is going a million miles an hour…I can’t decide …I guess I’d make Christmas decorations first. 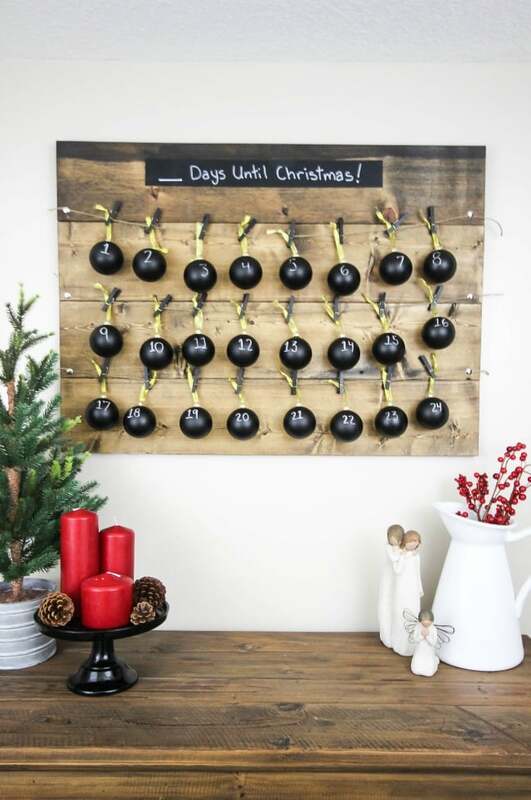 I’d love to try this, or make some signs for our home! I would love to make some customized mugs with vinyl! OMGosh this is too cute! 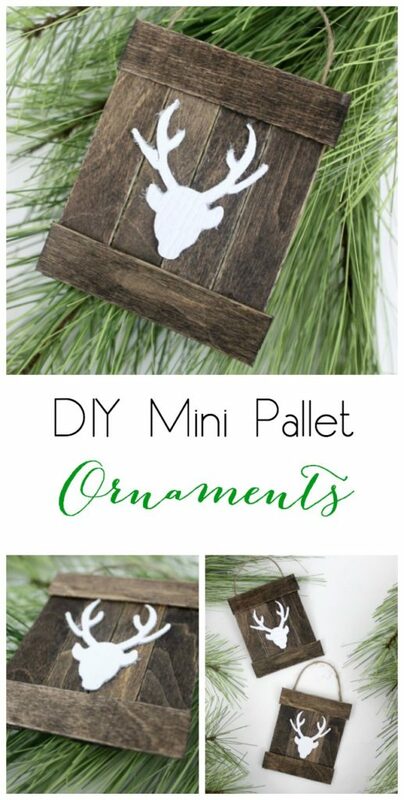 My first thought was ‘where did she get that adorable little pallet” and then read how you made it with the popsicle sticks – genius!!! Love this idea and thank you for sharing your creativity! The reindeer ornaments are adorable! I will be making this for sure! This is adorable – thank you for sharing! Very cute ornament!! Will look great on your tree! I would make stencils for wooden signs to give as gifts to my family. And maybe make my own Christmas cards! My baby bug just died so this would be an amazing upgrade! These deer would be just perfect for my new son in law who is a hunter! We also have a new grand daughter on the way and I have so many ideas for decor and scrapbook pages and albums! Thank you for the chance! I would make a Christmas ornament! What a cute ornament! Oooh I hope I win! 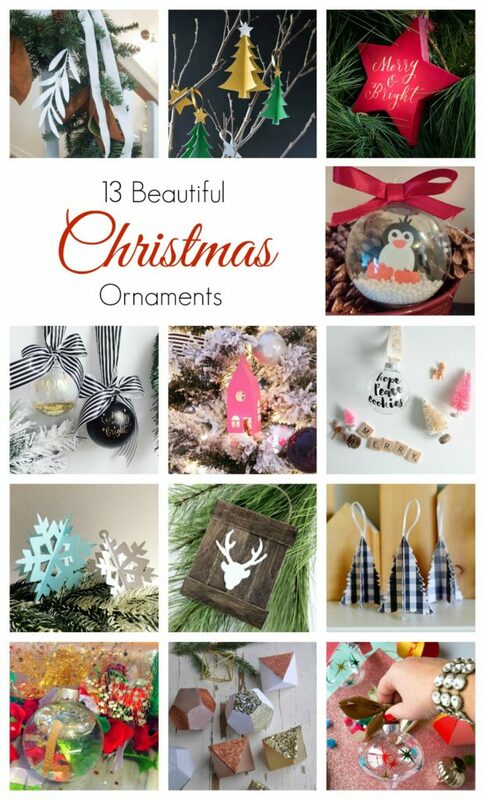 I actually would love to try and make these ornaments. We’re looking for ornaments that are not glass because we have acquired a very playful kitten since last Christmas. i want to make these!!! i also would make my own Christmas bags. This ornament is beyond adorable!! Pinning! I would like to make some thank you cards for my coworkers. So cute! Love to be able to make them! 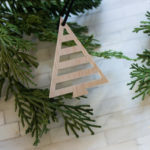 I saw some tree decorations make with vinyl that was cut on a Cricut that I would love to make. The ornaments you showed are really cute too! Looks great! I had tried cutting fabric with transfer tape as the backing and it was not as clean a cut as yours! I love that you used a textured leather. Top notch! What a great giveaway & projects!! Love my Cricut-though now I want the 2! This is so cute! I love how you made the pallet out of popsicle sticks! And the leather deer is awesome! I LOVE this ornament! Okay, first I would make a car sign for my business, then a few stencils for craft things I am making! I would make cute cards and gift tags! 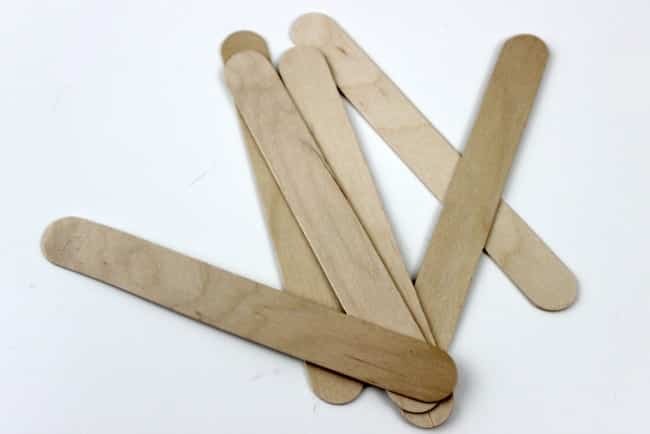 You took popsicle sticks and leather and made something so beautiful! Also, I’m happy to know the Cricut can cut leather!! 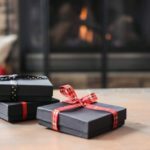 These would make great gifts too. Personalized to each person’s unique likes. Love the idea. 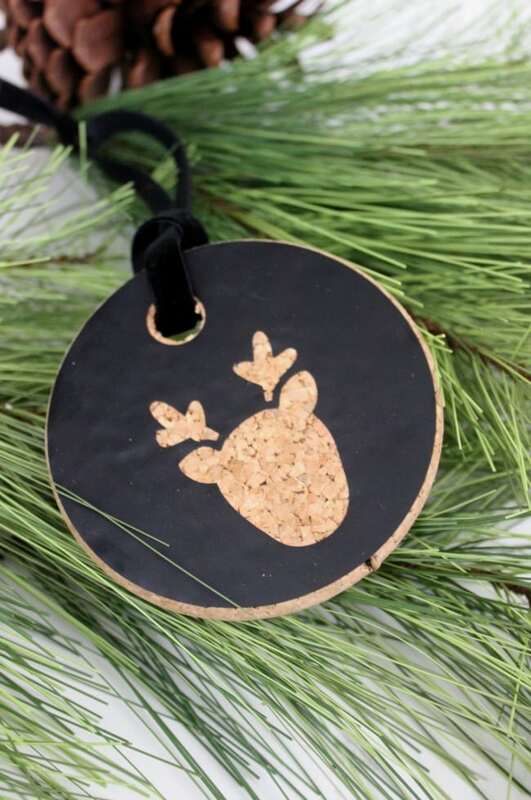 Definitely love the reindeer pallet tree ornament as well as the cork one! I want to make Christmas decorations with family with it. These are too cute! 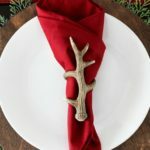 I love all the Christmas ideas that can be done with a cricut! So many crafts could be easily accomplished with one! I want to make some snowflake ornaments. Love your craft! so cute. What a cute idea! Love the use of leather and the suggestions on how to cut it. Amazing what a Cricut can do. I would make cards or gift tags! What a great giveaway! Would love to create something with my daughter with this! We were looking at it at the craft store! What type of scissors did you use to cut the popcicle sticks? Just regular crafting scissors :) Make sure you use sharp ones! I made 11 of these for the men in my Department at work. They all loved them. I did mine with brown vinyl and wrote on the top: Oh deer … and on the bottom It’s almost Christmas. I so love giving homemade gifts from presents. Extremely glad I found your design. Oh, I love that! Thank you so much for sharing that with me! So glad they all loved them!